In Top Gear's test of the 458, Jezza berated all prior V8 Ferraris for not being as good. The successors to today's Nice Price or Crack Pipe BMW have also reached greater heights, but none has equalled its foreboding looks. If the four horsemen of the apocalypse decided to drive rather than ride, they might choose to roll in something like today's ominous-looking 1988 BMW M5. That wouldn't have been the case with yesterday's contender, but along with pestilence, war, famine and death, 83% of you were ready to add that custom V8 PT Cruiser to the plague posse. In contrast to how irreparably altered yesterday's Chrysler was, today's ultimate factory expression of the E28 is block-rockin' stock. The original M5, as exemplified here, proved to be the fastest production sedan in the world upon its debut. Sporting a modified version of the M1's DOHC M88 six cylinder, the M5 took the American muscle car paradigm to its teutonic extreme by dropping that rabid motor in the mid-sizer 5's 3,417-lb package. 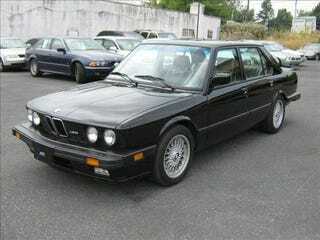 The Euro motor in the '85-'88 M5 was a 286-bhp 3,453-cc four-valver sporting 10.5:1 compression. The 1,244 (or there abouts) U.S. cars, had a derivation of that motor- the S38B35 - which gained a double-row cam chain and lowered, 9.8:1 compression, and produced a solid 252 horsepower. A standard Getrag 5-speed, unique suspension settings and Mahle TRX wheels complete the car's performance upgrades, while black-painted bumpers, front and rear aero-aids, and, of course, descreet M5 badging maintain a low key appearance. All the M5s officially shipped to the states came outfitted like one of my favorite beverages - black and tan - and this car is no exception. What may seem exceptional is the condition of both that ebony paint and the biscuit leather interior. Many E28 M5s on the market suffer age and use related wearing of the seats (especially the driver's side bolster), and the exterior rubber bits, which react to smog the same way that guy in RoboCop did to being chucked in a vat of toxic waste. This example however appears in nearly new condition, aside from some wrinkling in both the driver's Recaro bucket and the rear bumper's snood. That may be attributable to this M5 having only a little over 50K on the clock. That's way lower than most other M5s on the market, or 335is of comparable age for that matter. If the car runs as clean as it appears in the pictures, it may still be capable of the 6.5-second zero to sixty runs and 144 mph top speed the factory claimed of it when new. A word should be raised about that factory, as the E28 M5 wasn't assembled in the factory alongside its lessor brethren, but instead was hand-built at the BMW M GmbH shop in Garching. Unlke the line produced cars, which were intended for a reasonably broad audience, and hence had to abide by somewhat standard service schedules, the high strung nature of the M88 means it's more fragile, and keeping it running in top performing condition means more attention and money must be thrown at it. That, and replacement parts costs that would shock even the cat, mean getting the best example possible is the most prudent course of action, should you be of the mind to do so. The question is, should anyone go the 5-series full monte? A 535i, with its torquier M30 engine will give you much of the M5's performance at a fraction of the cost and maintenance headaches. That being said, the M5 gives you 100% of that performance, and for some people, less than that just isn't enough. Another question is whether this particular M5 is worth diving into to the tune of $16,998. Sure, it's being offered up by a dealer, where typically you're going to pay a premium over a private party, but this car's rarity, condition, and low mileage need to be factored in as well. There's lots of E28 M5s on the market right now, and this one happens to be about the priciest, although it also looks to be among the best. But what do you think, is a deuce-shy of seventeen large highway robbery for this low mileage M5? Or, does that price make this an M5 you'd embrace? Atlantic Motor Group or go here if the ad disappears.